French Minister Guillaume Garot samples school cuisine along with Schools Chancellor Dennis Walcott at Queens College School of Math, Science and Technology on July 2, 2013. FLUSHING — Vive la barbecue! A French food minister tipped his beret to American school lunches Tuesday afternoon, sampling the finest and healthiest fare that a Queens high school had to offer. Junior Minister for the Food Industry Guillaume Garot tucked into a plate of barbecue chicken, rice, plantains and broccoli at Queens College School for Math Science and Technology in Flushing as part of an international dietary and culinary exchange. “C’est tres bon, franchement [It's really good, frankly. 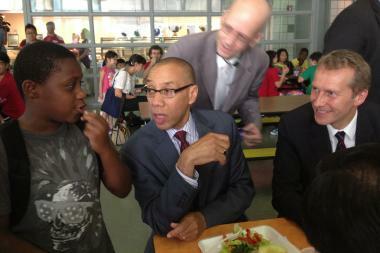 ],” he said of his meal, part of Mayor Michael Bloomberg administration's push to cut fat and sodium in schools. While he was standing on line he discovered the spork and Walcott explained the spoon/fork contraption through a translator. Garot — in the first visit of a top French official to a city school cafeteria — was in town to discuss French and New York school dinners, and exchange gastronomic best practices with the chancellor. “I believe that we can learn a lot from one another,” said Garot. While he said that child obesity was a bigger issue in the U.S., Garot noted that it was still a problem that France had to face. There was even talk of drafting a best practices agreement about school food. “Each kid, whether he or she is American or French, deserves quality food,” he added. And while Garot said he wasn't there to “lecture” or “give advice,” he did point out that children in France feast for 1-2 hours over a four course lunch and have a long and deep tradition of quality food. “Food isn’t a product like all the rest,” said Garot. “Respecting food entails respecting the person that produced it,” he added. In response to French perceptions that Americans feast on fatty food, Garot suggested critics “should come to this school. "They’d see it’s balanced and tasty,” he added.